My place of escape - filled with thoughts on LIFE, creations and the things I LOVE. TWO POSTS TODAY! 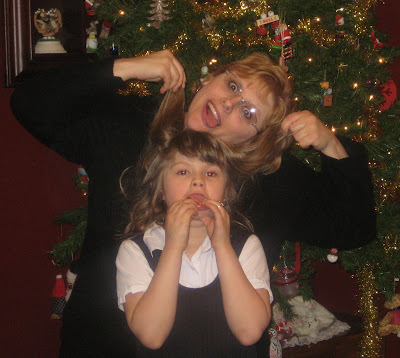 BELLI CHALLENGE #48 & ALL ABOUT JOY! SCROLL DOWN FOR ANOTHER POST FOR THE BLOG HOP! Not only is this the BELLI CHALLENGE but...this is also ALL Stampin Up! So that means it is an ALL ABOUT JOY card! What is the Belli Challenge you ask? Each week, I try to give us a challenge that will use things we have lying around our stamp rooms or homes! With a constant flow of new things coming out, I tend to forget about the other things I have and they quickly become clutter! 3. Share the link here in the comments linking to my Blog and CBC48. When you post to Splitcoaststampers or Paper Craft Planet or to your Blog, be sure and put CBC48 as the KEYWORD and mention of the challenge - with a link! 4. I will do a drawing and the person whose name I draw will be a BELLI GUEST DESIGNER the first week of February! Last week's winner was Anita- check her DELIGHTFUL and FUN project out HERE. For this challenge, I decided to use the AGED TILES technique from Technique Junkies! You can find more information about it here. I am CELEBRATING LIFE in this card. There are so many things I am thankful for this week and I am thankful for life! Be sure to check out the FABULOUS Belli Challenge Design Team's creations!!! Leave them a comment! We all LOVE to know what you are thinking about what we create. I know it makes me SMILE when you leave me a comment. I have started a GROUP on the PAPER CRAFT PLANET! I will be listing the challenges there and would love to have you join in the fun there too! I will not be posting the prizes on the group at this time. Any participants you want to be included in the prizes will need to come here to post their links! HAPPY NEW YEAR! BE SAFE TONIGHT! and end at Jessica's blog. I have to say each one of these ladies has really inspired me this year and it has been an honor to work with them and get to know them! They will definitely be listed in my favorites on my side bar and I will visit them often! I am SO excited! This stamp is from MY NEW RELEASE!!! It is called LOVE BLOOMS and the entire set will be given away HERE this week for my Blog Candy! 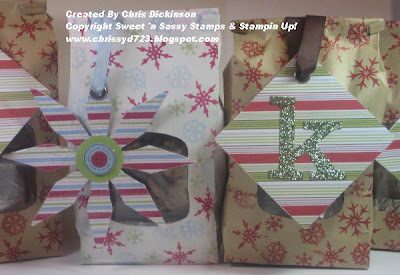 As soon as an image of the entire set is posted on the Sweet 'n Sassy Stamps Blog, I will post it here too!!! I made a mistake yesterday when I said to pop by to see Courtney's Challenge. We are taking the week off for the Christmas Season and New Year Celebration! Happy NEW YEAR!!!! I hope you all are having a wonderful Christmas season. My husband is home on vacation this week, so we are staying up late, sleeping in and doing some things around the house. As much as I love having him home now, when he returns to work it will be nice, so I can resume my normal routine! ;) I asked him yesterday if it would be disrespectful to say he screws up my MOJO FLOW? ***giggle*** He just said, "HUH!?" I think that is something only us stampers can appreciate. 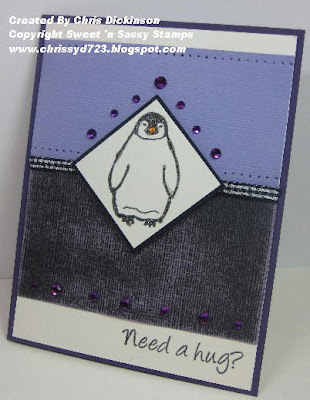 I made this card with the CUTE Penguin Hugs stamp set from Sweet 'n Sassy. I also grabbed my Hocus Pocus Black Magic Co'ordinations cardstock for this. I just LOVE it!!! I sanded it a bit and the purple popped out! Then I used the Purple Co'ordinations regular cardstock as an extra layer and paper pierced it. Added a touch of bling (ok...maybe a bit more than a touch) around the top portion and along the bottom. 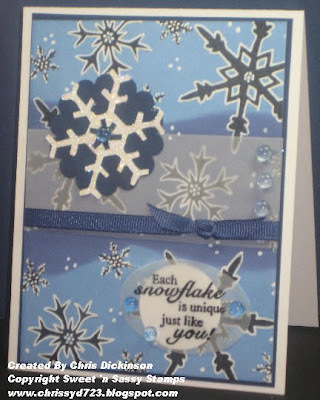 This was actually scraps left over from a Snowflake card we made last month at a class I held! Today will be one filled with preparations for our New Year's Eve gathering. Some cooking and cleaning and I *hope* some stamping too. Don't forget to pop by tomorrow! It is NOT only the BELLI CHALLENGE DAY but we are starting the BLOG HOP and celebrating our 2008 Design Team and featuring them! 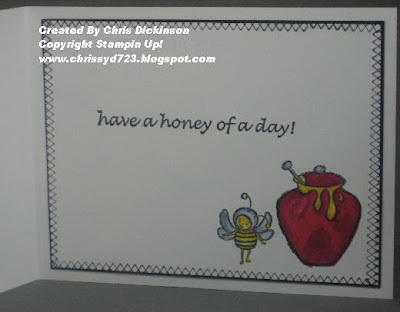 I will have a new stamp set revealed each day, so come on by! Also, each of the NEW Design Team (including me) will be giving away a Sweet 'n Sassy Stamps NEW RELEASE stamp set! Thank you for coming by! Have a fabulous day! Tomorrow is Courtney's Challenge Chick Day - so be sure to stop by! Wednesday is Belli Challenge Day. Did you participate yet? Be sure to participate for a chance to win! You can find out more about this week's Belli Challenge HERE. I would LOVE to have you join us and to see YOUR creation! I have another NEW stamp set coming out this weekend! I can't wait to show you it and the creations I have made with it. Come back this week for YOUR CHANCE to WIN IT!!! Thank you for coming by! Have a great day! Hello! Just wanted to pop in to say hello! I will be back on Monday. I am taking a few days off of blogging to spend time with my family. Regular programming will return on Monday! Have a nice weekend! I took the past 2 days off and just enjoyed my family. I hope you all did too! I decided to use this stamp set I purchased and didn't put together *gasp* until today! If you have been here before, you know that an ALL ABOUT JOY card is for my girlfriend Joy, who wants me to make cards using Stampin' Up! Only - but you know there are times, I can't help but deviate from that and use other embellishments. So this is a card for Joy! There are TWO things that are not SU - the cuttle bug Swiss Dots AND the Red Bling Stickers. She will understand though and still HAVE to love me, despite my straying from the original plan, RIGHT? This week's Bloggers Challenge is a CELEBRATION theme, so I decided to focus on Valentine's Day. In fact...the next week or so will be cards with that theme, I think. LOL I wan tto focus now on something other than Christmas cards. I feel I have been making a ton of those and I am ready to do something else! When you are done looking here, be sure to check out the other Blogger Challenge participants (links are on the Bloggers Challenge icon.) Their work is SURE to WOW you! 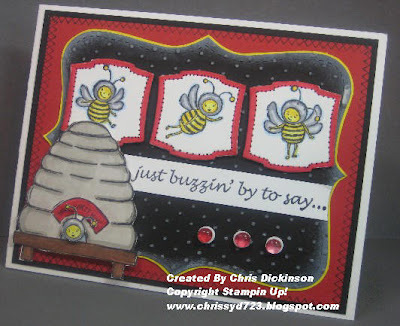 Next week will be the Sweet 'n Sassy Stamps Blog Hop and Release Party! I hope to see you all there! Thank you for stopping by! Have a fabulous weekend! I love this video and thought I would share it with you! Merry Christmas! Scroll down for the Belli Challenge today! call this week's Belli Challenge - BELLI'S OF THE PAST! This weeks, Belli Challenge is to make a project using YOUR CHOICE of any of the Past BELLI CHALLENGES! You can make ANYTHING you wish AND use WHATEVER BELLI you wish, even combine challenges with another! 2. Make a completed project with ANY of the Bellis of the past. Share the link here in the comments linking to my Blog and CBC47. When you post to Splitcoaststampers or Paper Craft Planet or to your Blog, be sure and put CBC47 as the KEYWORD and mention of the challenge - with a link! 3. I will do a drawing and the person whose name I draw will get an assortment of Designer Papers! Last week's winner was Kristin- check her beautiful project out HERE. 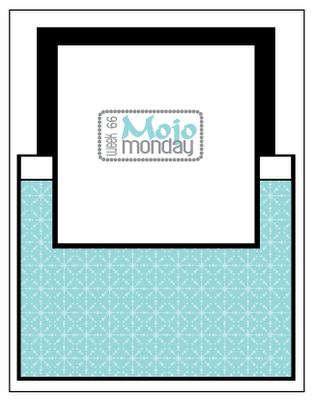 For this challenge, I used the Mojo Monday Sketch #66 as my inspiration. You can find more information about it here. 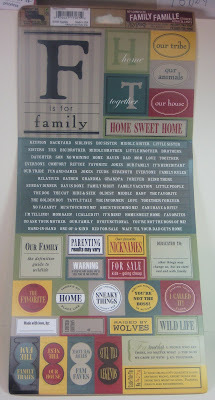 I have fallen in love with the new Co'ordinations Cardstock that Korin carries at Sweet 'n Sassy Stamps! It is called the Black Magic by Co'ordinations and it is a textured cardstock that is BLACK and has a colored CORE. On this card, I crumpled the black cardstock, then unfolded it and sanded only the wrinkled portions, giving it a marblized look. I also spritzed some Glimmer Mists on to give it the shimmer. If you buy this cardstock, it will not have the shimmer! You can find it HERE for a very reasonable price. One more thing! I have started a GROUP on the PAPER CRAFT PLANET! I will be listing the challenges there and would love to have you join in the fun there too! I will not be posting the prizes on the group at this time. Any participants you want to be included in the prizes will need to come here to post their links! I think it has been a few weeks since I have created an ALL ABOUT JOY card. For those of you who are new here, I have a local friend Joy who often tells me she enjoys seeing my Stampin' Up! Only cards. So I have created a day for her. :) I try to put an SU only card once a week. I used this as my Featured Stamper Challenge on Splitcoast on Sunday, but I really went off course from the orginal card. :) You are supposed to change at least 2 things from the card, but I changed a few more. 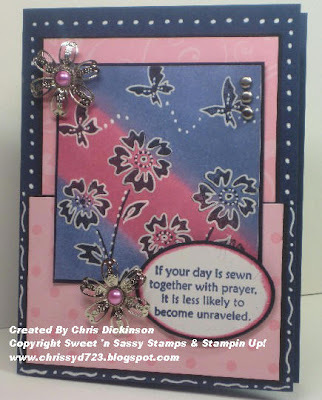 This week's Featured Stamper was Paulatracy and HERE is the card I cased. Her entire gallery of work is absolutely FABULOUS and her coloring is impeccable! I used the Cuttlebug Highlights technique -and then sponged the edges with white craft ink. I colored these cute little bumble bees with Copics and used the Nestibilities to frame them, then the Big Shot Top Note die. 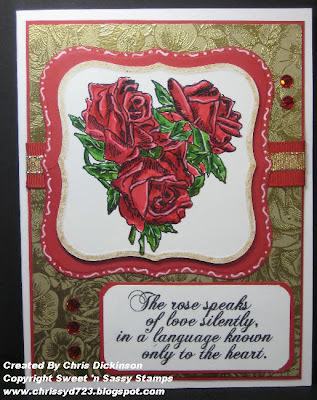 You will notice, I did use Dew Drops on this card, if you would choose to use strictly SU, I would advise Joy to use the Black Vintage Brads in place of the Dew Drops - but I prefer the Dew Drops. Now, anyone who gets this card will be VERY special - because I decorated the inside! :) Come back tomorrow for the BELLI CHALLENGE in between your Christmas preparations or when you are ready to wind down! HAVE A VERY MERRY CHRISTMAS! One of my friends (Janette- thank you!) sent me some Thomas Kincade images, so I grabbed that and ran it through the Big Shot with the Top Note Die. She had already scored it for me, so I sponged around the sky with Night of Navy Ink and then colored the windows and lights with yellow. 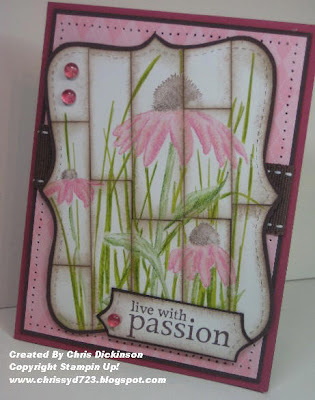 Sunday is Featured Stamper Day and we had such a beautiful gallery filled with the most amazing cards by Paulatracy...I used this card for my inspiration here. Check out her gallery, it is VERY IMPRESSIVE! I have been posting my projects at night, but have not felt very chatty, so I may have to change the time I add things. LOL Maybe being not so chatty is a good thing? Have a Happy Monday! I will be out doing some last minute Christmas shopping! Hope you have a great day! Thank you for stopping by! I have fallen in love with a new technique from Technique Junkies. It is called the BANDANA TECHNIQUE. After playing with it yesterday, (see this POST) I had to play some more! 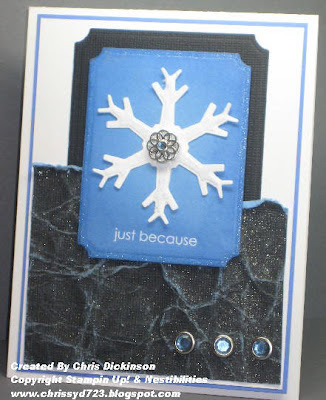 I immediately envisioned it with my Snowflakes stamp set, but the black intimidated me until I played with another stamp set first. I used Color Box inks and sponge daubers to create this background. I also used Paper Craft Planet's Sketch Challenge as my inspiration for a lay out. Thank you for looking! Have a fabulous day! GUEST DESIGNER AND AN INVITATION FOR YOU! 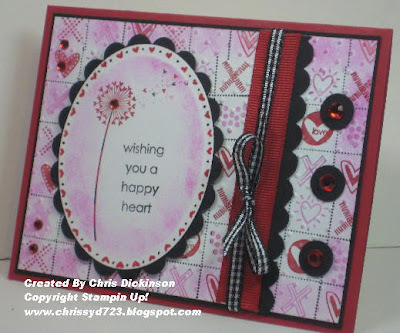 This month, I am the GUEST DESIGNER for the Sweet 'n Sassy Stamps Blog! I am very excited about this and have been posting things through out the month. If you do not go there often, I would highly encourage you to check frequently! They have some wonderful projects posted by other Design Team members AND they have Guest Designers who are NOT on the Design Team as well! There will be many Guest Designers in 2009 who are not part of the Design Team. I am also very excited because I have started a NEW GROUP on Paper Crafting Planet -just for the BELLI CHALLENGES! The Challenges and pictures for the Design Team will still be HERE all in one convenient place - but I thought it would be a fabulous way for us to get to know each other better and have everyone share in the excitement of your work! So posting can be done there with links and things. I will include more information on the group - but please come join us! Now for todays project...I participated in Paper Craft Planets Sketch Challenge . A few months ago, Technique Junkies had a Challenge called the BANDANA TECHNIQUE, but between August- early December, I am pretty busy with school and church activities, so I didn't get a chance to try it out until this week. I had so much fun with this technique and love the results so much, I am going to make another card with using the technique! Be sure to check out the other Bloggers Challenge participants on the side bar! They always inspire me! Thank you for stopping by! I will sell you to the gypsies. I also combined this with Mondays TECHNIQUE LOVERS CHALLENGE on Splitcoast Stampers that was the TAG STAR BURST! Just so you know - I have declared cookies my enemy. Not chocolate, not ice cream... COOKIES. I eat one and walk away. Come back and grab another - say to myself, all done. Walk away and those darn cookies CALL ME BACK! ARGH! After these are gone - NO MORE COOKIES!!! I hope you have a great day! Thank you for stopping by!Be Blessed! This weeks, Belli Challenge is to make a project using your WRAPPING PAPER. You can make ANYTHING you wish AND combine challenges with your WRAPPING PAPER and it doesn't even have to be CHRISTMAS! Grab any of your wrapping paper and use it up! Perfect for those left over scraps you have! 2. Make a completed project with ANY WRAPPING PAPER. Share the link here in the comments linking to my Blog and CBC46. When you post to Splitcoaststampers or to your Blog, be sure and put CBC46 as the KEYWORD and mention of the challenge - with a link! 4. 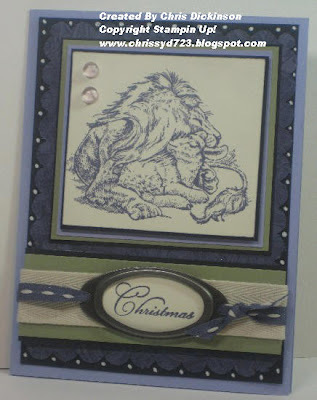 You can have an extra opportunity to win from Lorie Ames if you link your creation here on my Blog AND on Lorie's Blog! Last week's winner was LUVLEE - check her beautiful project out HERE. Be on the look out for her to be featured here! Can you tell what part of my project is wrapping paper? well, I will let you know... It is the Snowman all the way through the square and blue - The wrapping paper matched Pacific Point PERFECTLY! I'm glued to the tree. I'm wondering what Santa brought just for me. Could it be cardstock or chipboard or lace? "Or a Cricut," I said, with a smile on my face. And that's when I heard him, "Hi Santa!" I said. "You know....good little girls should be in their beds." "I know I should Santa, and now I've got caught. But I was just so excited to see what you brought." "Well, let's take a look in this room where you work." He shook his head quickly, and left with a jerk. "You've got enough stuff, I'll see you next year!" Thank you for stopping by! Have a fabulous day! 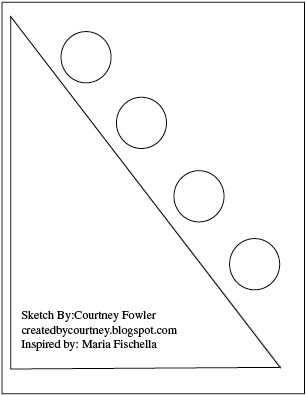 This week's Tuesday Challenge from Courtney is a sketch challenge. 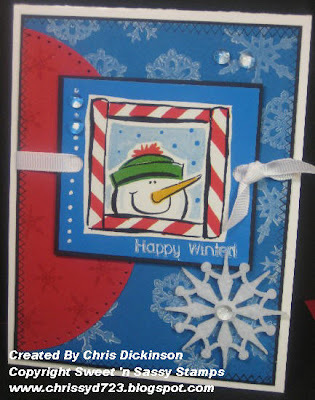 I had a pile of chipboard snowflakes laying on my desk and this paper jumped into my hand as I bent over to look at my DP - so I HAD to use my Snowflake stamp set! We are supposed to get snow today! I am so excited. I really LOVE snow! For me, there is nothing better than to be home and have a snow storm!!! I can be all snuggley, knowing that I get to just relax and enjoy the beauty of the weather. The past 2 snow "storms" we were supposed to have ended up being only rain - so I was a bit disappointed. 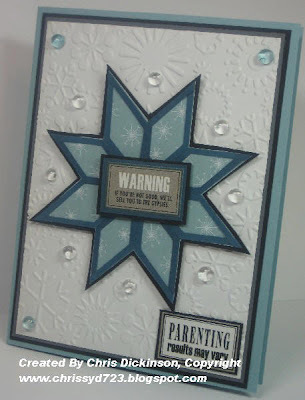 I used WHITE Craft Ink and Embossed White EP first, then sprinkled Hologram Highlights to make the big snowflake sparkly. Be sure to check out the other Challenge Chick's projects. I always enjoy seeing their creations! One last thing...Be sure to check out Jennifer Greco's blog for a chance at some Blog Candy! It has been rainy and damp and cold here in Wisconsin, so I often dream of a cozy fireplace even though I do not have one! 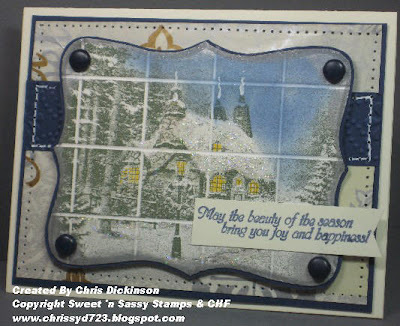 So I settle for an image of one by using my Winter At Home stamp set. :) I colored this with my Copics and went over with a bit of yellow to give it a warm glow. Now, once you are done looking through my blog, take some time to go to the Sweet 'n Sassy Stamps Blog to see the other Design Team Members FABULOUS projects for the Round Up this week. AND come back for the BLOG HOP after Christmas! There are more details on the side bar of my blog. Don't forget about the Sweet 'n Sassy Stamps sale too! Oh one more thing...Monday is DT Challenge Day on the Blog too! Check it out and play along for your chance to win! Have a great week! All year our theme was GATES, so as we closed this year in praising GOD for all that He has done in our lives, I thought this stamp set was fitting, so I made each person on our team one of these cards, there were 10 in all. 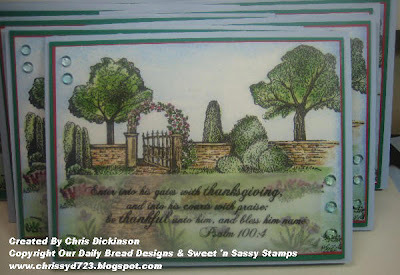 I used Sweet 'n Sassy Stamps - Thanksgiving Blessings stamp set and colored the image with Copics. They blend beautifully! As I am closing out 2008 and heading into 2009, I know I am not the same spiritually as I was at the beginning of the year. God has been chipping away at the scars within me, healing me and molding me like clay into some thing more. I know I have not arrived yet, but I look forward to see what He has in store for our family for the coming year. I pray your New Year will be filled with much happiness, joy and good health! ENJOY THE SEASON! MERRY CHRISTMAS! I purchased these FABULOUS gift bags in bulk with some girlfriends, so I am sorry I am not sure where to let you know to buy them. (I will try to find out) These bags are FABULOUS! They have a nice lining in them and the window is perfect to show case your goodies. 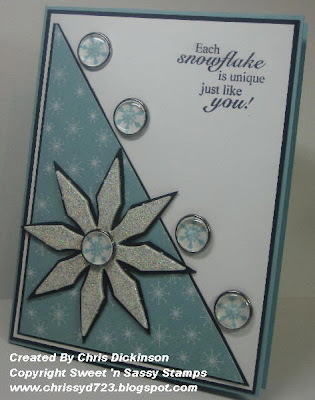 I used my Snowflakes Stamp Set by Sweet 'n Sassy Stamps and the Chipboard and Designer Paper is from Sweet 'n Sassy Stamps. The ornaments are ones I made for the Bloggers Challenge on yesterdays post! Today, I am celebrating Christmas with my family! I hope you are enjoying the Christmas Season! Merry Christmas! Have a blessed day! 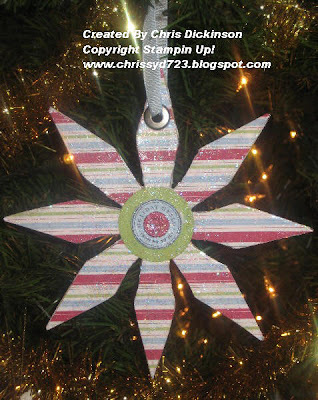 This weeks Bloggers Challenge is to make ornaments. I used the CHIPBOARD kits from SU and a coaster for the other ornament. I have TWO ornaments for you today! 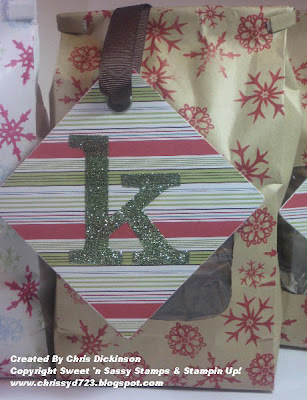 I am actually going to use these as tags on gifts! 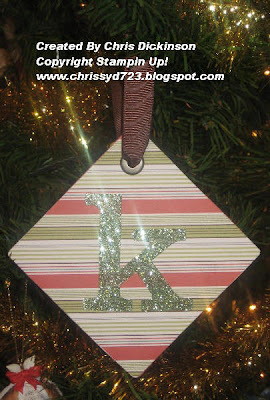 The first ornament, I used the STICKY CUT letters with the Fine Cosmo Glitter. I love how it turned out! This one uses a the kit and the retired DP Cutie Pie, I had laying around. I will use this one for my neice. I sanded the edges down, but had problems getting into the grooves. I went and grabbed my Sparkly Modgepodge - can you see the shimmer? I love how it looks! For the picture, I decided to hang them on my tree to make them look a bit more festive! Be sure to check out the other Blogger Challenge Participants. I love seeing what they create! Hello and welcome to my blog! 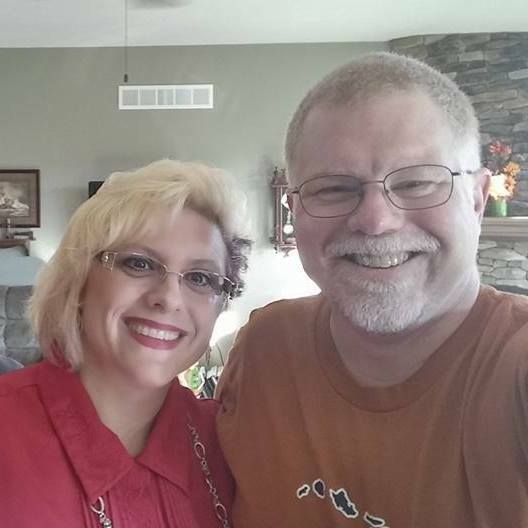 My name is Chris Dickinson, a wife to Adam and mom to four beautiful children. 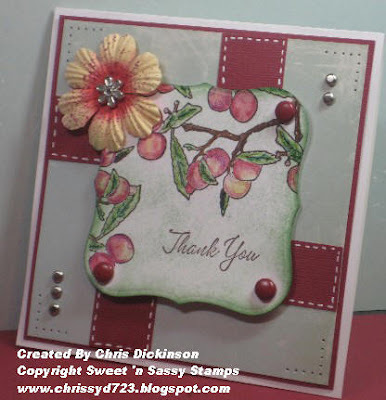 I have worked with so many talented people through stamping for over 15 years. Stamping is my "therapy and happy space." My faith is a big part of my life. I am a believer in Jesus Christ, and my mission to share His love, mercy and grace to all whom I encounter. I am blessed beyond measure in my life. It is not perfect, but I am thankful for all that I have. I LOVE VISITORS! THANK YOU FOR STOPPING BY! O' CHRISTMAS TREE With a TUTORIAL! I LOVE MY VISITORS! THANK YOU FOR STOPPING BY! In accordance with FTC16CFR, Part 255, I declare that I currently receive or have received products that I promote and endorse for free or at a discount from the following companies: I Brake For Stamps, Our Daily Bread Designs, Spellbinders, Creative Cuts and More, Technique Junkies Newsletter, Susana's Custom Art and Card Creations, Dude Time Doodles, Mark's Finest Papers, DRS Designs, Creative Inspiration Paints, Classy Cards 'n Such. These companies generously supply me with complimentary products for promotional purposes. ......... my enthusiasm in promoting their products does not stem from the fact that I am compensated by them, but because I love their products and feel their product lines and services to be superior in this industry.